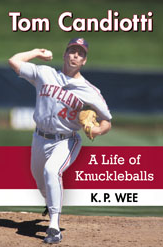 « The best knuckleballer over the past 25-30 years….? Don’t give me the ball…. Twins right-hander Phil Hughes is one out shy of reaching 210 innings this season, which will cost him a $500,000 bonus. His half-million-dollar bonus kicks in if he reaches 210 innings, and he is at 209.2 after a rain delay forced him out of his final scheduled start on September 24 against Arizona, in a game where he went eight innings. Of course, Hughes also set a record in that last start, as he finished the season with 16 walks and 186 strikeouts, with his 11.63 strikeouts-to-walks ratio the best all-time for pitchers with a qualifying number of innings. He also has the same number of wins and walks, 16. You can also argue that the Cardinals’ main rival, the Chicago Cubs, cost Tewksbury that ERA title too. On August 31, his ERA was 2.01 after he gave up zero earned runs (and two runs total) in a complete-game victory over San Diego. He gave up two earned runs in each of his next two starts to improve to 16-5 with a 2.07 ERA. Then on September 18 at Wrigley Field, the Cubs pounded him for six earned runs in five innings and his ERA rose to 2.27. Tewksbury rebounded in his final two starts of the year – one earned run in 15 innings – but lost out to Swift. Another thing too was at the time, he was thought of as a guy who would steal the Cy Young from reigning winner Tom Glavine, who raced out to a 19-3 start by August 19 before slumping late in the year (going 1-5 the rest of the way). On September 13, Tewksbury was 16-5 with three more starts to go, and had he won all three, would have had a shot. Alas, it was Greg Maddux (20-11, 2.18) of the Cubs who wound up being hot in the final weeks to take that sure Cy Young victory away from Glavine (20-8, 2.76). So, that Hughes story made me think back to Tewksbury losing a couple of major accomplishments in 1992. Of course, they are not the same as one is money and the other is about awards… though I’m sure Tewksbury probably would have had some bonus clauses in his contract that would be triggered had he won the ERA title and/or the Cy Young. In 1993, Tewksbury then went 17-10 (but with a mediocre 3.83 ERA) and walked just 20 batters, again nearly having the same number of victories and walks. He looked like the second coming of Bob Gibson the following year, winning each of his first six starts and getting out to an 8-1 record. Alas, the wheels fell off and he finished 12-10 with an ugly 5.32 ERA, notching a 6.72 earned-run average in his last 14 starts before the strike wiped out the remainder of the season. He walked 22 in 155.2 innings in 1994. Bill Gullickson was another guy who gave up a lot of hits and didn’t walk that many hitters, though he didn’t have the control that Tewksbury did. After going 20-9 with a 3.90 ERA for the powerful Tigers in 1991, Gullickson was poised to win 20 games for the second straight season. On August 7, he beat Toronto 7-2 on a complete-game eight-hitter to improve to 13-7 with at least 10 starts remaining. Alas, he went 1-6 in his final 10 starts with a 6.45 ERA, including 0-5 and 7.79 in September and October. And finally back to the Twins, who have said that they would let Hughes pitch out of the bullpen on the final weekend of the season to get the one out to trigger the bonus, according to USA Today. However, Hughes has declined. …which reminds me of another Twins pitcher from 1988. That season, lefty Allan Anderson had a scheduled start on the final day of the season, but teammate Bert Blyleven told manager Tom Kelly that if Anderson sat out, he would win the ERA title. Kelly gave the left-hander a choice, and Anderson decided to sit out indeed, backing into the ERA championship. It was the first time he had led the ERA race all season, because on the penultimate night of the season on October 1, ERA leader Teddy Higuera of the Brewers gave up three earned runs in 6.2 innings to bump his ERA from 2.41 to 2.45. More accurately, it was 2.4545. Anderson’s ERA was 2.4465, after his shutout against Oakland on September 27. While both ERAs rounded to 2.45, Anderson’s ERA was lower, and he won the ERA title by sitting out his final start on October 2. What Phil Hughes has decided in 2014 – declining to pitch again just so that he could make an extra $500,000 – is certainly more admirable than what Anderson had chosen in 1988. Bravo, Phil Hughes. This entry was posted on September 27, 2014, 1:02 am and is filed under (Baseball) Life Ain't Fair..., All About Innings, Baseball. You can follow any responses to this entry through RSS 2.0. You can leave a response, or trackback from your own site.